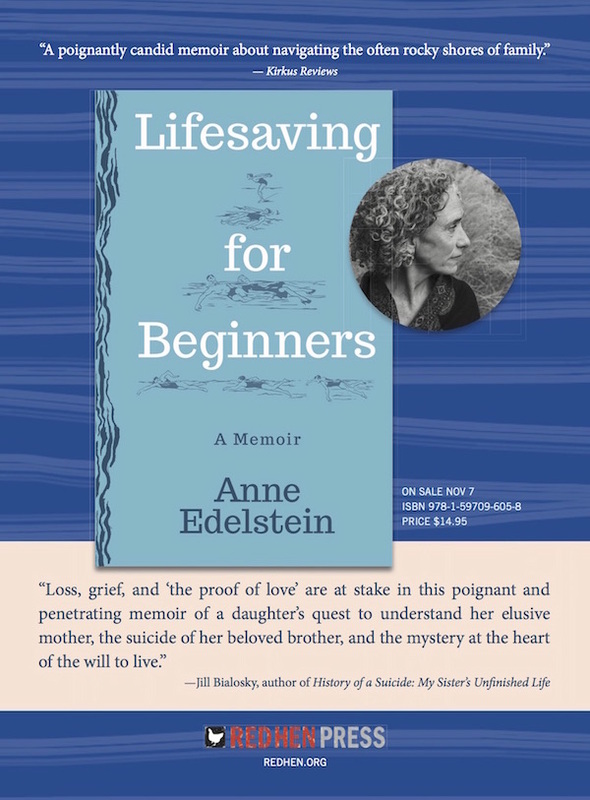 "In this stunningly eloquent memoir, Edelstein grieves for her mother’s drowning to unearth an even deeper grief—the one for her brother who killed himself fifteen years before. In what can be the sometimes garrote of family (as well as its absolute joys) alongside a legacy of mental illness, Lifesaving for Beginners is a graceful GPS for finding your safe shore, no matter how distant it seems." “While dramatic events set this memoir in motion, the triumph of Lifesaving for Beginners is that its heart lies not in the large ruptures of life but in the reconciliations that arrive quietly and routinely. I admire—and envy—the writing in this book. Its smooth surface belies its depths, much like the open waters Edelstein swims in as she seeks her own calmness and consolation." "Anne Edelstein’s remarkable debut is an unforgettable—and unputdownable—portrait of a singular American family. Reminiscent of Vivian Gornick’s Fierce Attachments and Daphne Merkin’s This Close to Happy, this powerful memoir reads like a conversation with your kindest, funniest, most incisive friend." “Anne Edelstein maps the tragic legacy of her brother's suicide and her mother's accidental death with grace and fortitude, shedding light on the darkest of secrets. In the quotidian domain of family life, she finds the simple poetry of love and forgiveness. Lifesaving for Beginners is a soaring tribute to the ties that bind us, what makes us whole as human beings."